Yesterday I listed two more new prints from my 2007 catalog. The originals for these two will be shown in my gallery show in Gallup starting this coming weekend. The prints are available in my Etsy shop. They are both Limited Editions of 50 and come with Certificates of Authenticity. 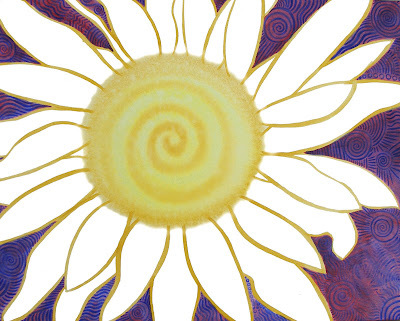 Daisy has an image size of 12 x 16 inches and Sunburst has an image size of 8 3/4 x 8 3/4″. This entry was posted in daisy, flowers, limited edition, new catalog, prints. Bookmark the permalink. For some reason the second one looks familiar to me, but I know I’ve never seen the first one before. They are both really wonderful! Mary, the first one is familiar because I had it posted in the upper right hand corner of my blog for quite awhile after I painted it. I think I may have posted it in a blog post too. 2 of my favorites! These should do really really well in your shop. The intensity in these is just great. You really have a grasp of your colors. 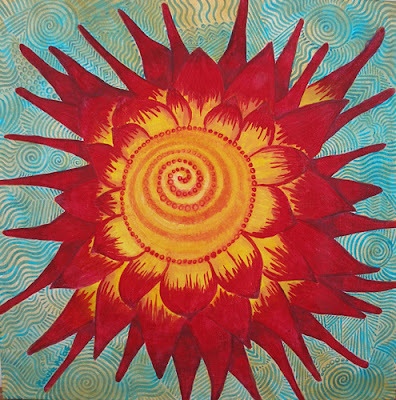 Cynthia, Thanks and you were right, I sold my first Sunburst print this morning! Coming from “the colorist” that is quite a compliment, thanks for stopping by! I love the daisy one. Very nice colours. Impressive work.